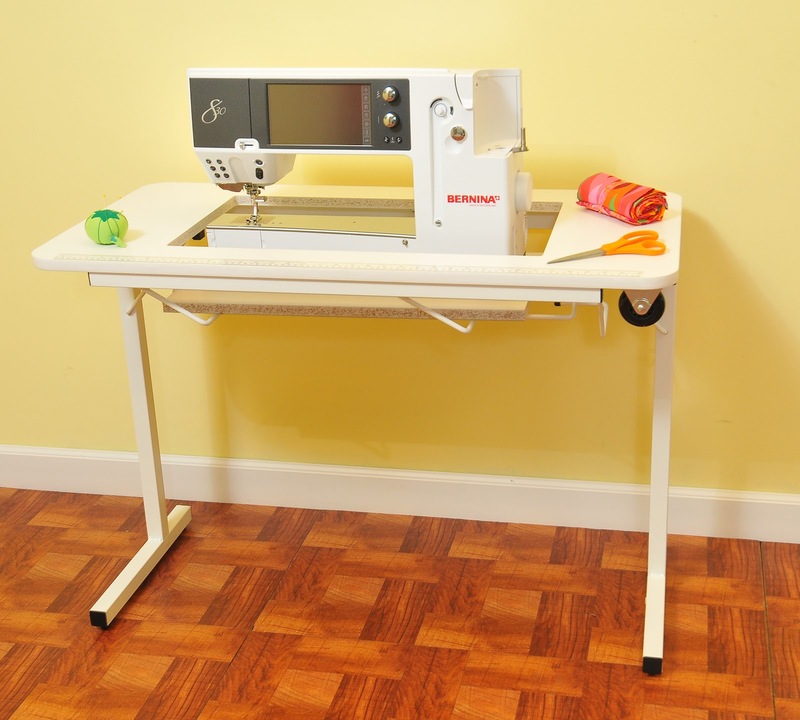 Arrow Sewing Cabinets: It's Gidget Giveaway Time! Are You Registered? First, we'd like to welcome all of our new Facebook friends - thanks for "liking" us! Because so many of you have joined us in the last day or so, we have a lot of Gidget sewing tables to give away! For those of you that are new, let us explain: over the past two years, we have given away one of our awesome Gidget II sewing tables every time we add 500 fans on Facebook. When we reached 10,000 fans, we gave away an entire sewing suite! Since we have jumped from a little over 10,600 likes to over 14,000 likes (at this writing) in just a few days, we'll be giving away SIX Gidget II sewing tables - three lucky Facebook fans will be chosen to receive one, AND we'll send one to their favorite sewing/quilting store! We also do a small "swag" giveaway every Friday - just for fun! Now, the important part - registering for the giveaways! We don't ask you to sign up every time we hit 500 - once you register, your entry is good for ALL of the giveaways until we hit a big milestone - the next one is 20,000! However, if you're a fan of ours from way back and haven't re-registered since our sewing suite giveaway, you will have to register again. Remember. you only need to sign up once - duplicate entries will be deleted! To register, visit our Facebook page and click on the purple "Sign Up For Our Giveaways!" tile under our timeline photo. If you're on a mobile device, please copy and paste this link into your browser: http://on.fb.me/XzJzcV That's it - easy peasy! If you do try to register and your name is already in, you'll get an "already registered" message - that's okay - it means you're in. Folks that enter using multiple emails are the ones that will be deleted. We also do some surprise giveaways, so be sure to visit with us often. Good luck everyone! Please note: Our giveaways are open to residents of the contiguous United States, Alaska, and Canada, and are not affiliated in any way with Facebook. I would love to win this fabulous table, so I could take my sewing machine off my dining room table. I would like to win this table. This would come in so useful. one day, maybe I'll win something! I know that I registered with you a longtime ago when you had just started your facebook page and I think that I registered again after you gave away the suite. If I had tried registering again (not remembering if I had), how would I know that my name was deleted? I sure wouldn't want to miss out on your giveaways! Hi Sheila! I updated the post, so you'll know how to check! I can tell that this sewing table would be a god-send to me. I am in a wheel chair and have to strain to reach my machine with the table I am using now. this table would make it so much easier to get closer to my machine. Oh please please please!!!! Fingers crossed!!! Thank you! Would love to win this. My machine is on my dining room table. WOWZA!!!! What a great giveaway! What an awesome company! Thanks! These tables are awesome -especially when you add the insert to make it fit your machine exactly. I wouldn't mind winning an extra one! OH how wonderful. I need this very badly now. My future DIL who lives with us (along with my son and granddaughter)is now using my 2nd machine so we have lost our kitchen table to her sewing area. My kitchen is small so that table is often used in preparing meals so I really would be thrilled. I think I am entered but not sure. I read that you delete duplicate entries but I wondered if we are already signed up if we'll get an error notice that we have already or if it means extra work for you to do that manually? Hi Vicki! I updated the post to explain how to check. I think you're okay though! Spot all picked out... just need a sewing table to complete my sewing corner. Oh gosh I would love to win this little beauty! Then I could leave my machine up instead of taking it off the table all the time. Thanks for your generous giveaway! I would love to sew outside on my second story porch here in Yellville, AR. It is like being in a tree house. This portable table is the answer to that dream. Oh boy oh boy could I use th tin my sewign room. I would soooo love to win one! I would really like to win.!!!!!!!!!!!!!!!!!!!!!!!!!!!!!!!!!!! Thanks for a chance to win and good luck to everyone! 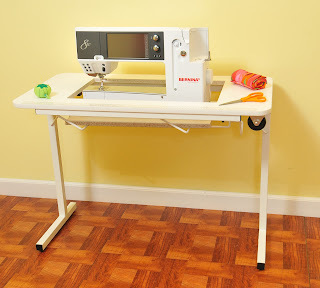 I would really like a dedicated sewing table -- I have to move things around to use my sewing machine or my serger! Arrow cabinets ROCK! I would so love to win this. My sewing machine is on a wobbly card table in the living. room. This cabinet would be so great to steady my machine and it would be a great addition to my living room decor! I love your giveaways! I really would love to win one of your tables. Thanks! Awesome giveaway. Thanks for being so generous! Oh please, oh please! Would love to win a table! You guys are such a generous company! I would definitely love to own one of those tables! I've been working on a very rickety wooden TV tray & it's a game of catch me if you can when I'm doing free motion quilting. Winning an Arrow sewing table will be exciting! WooHoo loveeeeee the gidget and the apron!! I would love to have a table like this. Having my machine sewing area level I am sure would make me a better sewer. My sister want the table for Christmas. I wonder if she got one. My oh my ... would love to have this little sewing table. Thanks for the opportunity to win one. thanks for your awesome giveaways!! Would love to have my sewing machine on that table instead of a card table. So nice to have the correct accessories when sewing! Trying this again... hope it works! Would love to win this table and not have to constantly move the sewing machine off the kitchen table so we can eat and also have something thats the right height. Ahhh I can't register since I live in Norway. It is understandable though since it would be very expensive for you to send it here. Just in time! 3:17 I had a few mintues to spare to register. this would be so much nicer than the six foot table I have to set up every now and then for my machine! I would love to have this. Thanks for the opportunity! Thank you for this amazing chance!! I hope my registration went through! I truly NEED this table. Thank you for offering it and I hope to win! Oh WOW I love that table, not many will fit in my sewing room but this little gem sure will. Thank You, Good Luck Everyone ! I live in a very small space. This table would be perfect! I would love one as I live in an apartment and I don't have a lot of room thanks for the chance to win something that great. I really need a new sewing table. I would love, love this. Would love a new table. I'd have to rearrange to use it though. I would love to get my sewing room off my kitchen table.... my husband would too. Would love a sewing table! Especially one of these!! I would love to have this table to give me a better place for my machine. Please pick me! Would love to win, even so, good luck everyone! This table is fabulous! Would love to win one!!! Thank you I too would really love to win this! Would love to win this....great win!! I would love to win one, my space is so small to work in already, Thanks. Would be very handy and somewhat portable. This would help my sewing room our immensely! Love it! I would love this as I plan to teach my granddaughter to sew and this would be perfect to place a machine on for her. Love that table, my condo is short on sewing space. That would make life much easier around here !!! Thank You. Here I am registering for a fantastic deal. I would love the table. My machine is on a wobbly card table. hello,just want to say How much I would love to have one of your tables,it would make sewing a lot better,I'm sure! THANKS FOR A CHANCE!! !